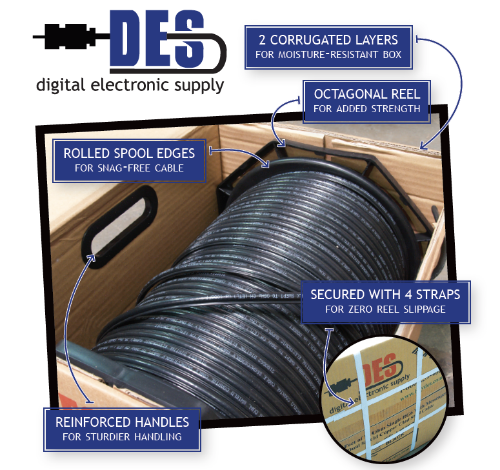 The double layering provides a moisture resistant box to help keep the cable dry. An octagonal shape gives the spool the strength it needs to not get squished or out of shape too easily. There's nothing worse than a bad snag in the cable line during an installation. The rolled spool edges provide a snag-free experience. The straps help hold everything in place and provide zero reel slippage. You won't find wimpy handles on these boxes. Everyone likes a sturdy grip. It's easy to see how well DES builds these cable boxes! Courtesy of DES, you can see a video they produced to explain all of the features and benefits we listed above. 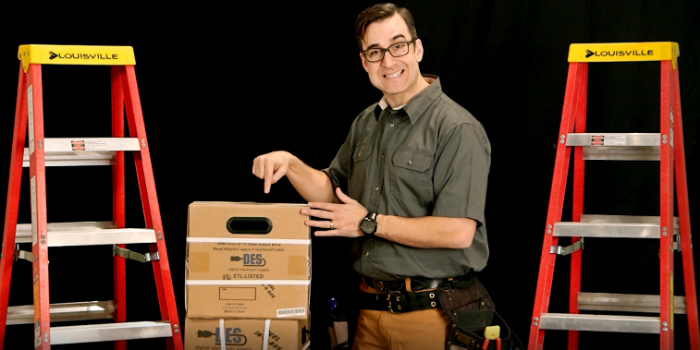 Take a couple minutes to see this box of cable in action. It works well and can take a beating! As mentioned in the video, there is significant cost savings to the way these cable boxes have been designed and engineered. It's common for technicians to throw away the last bit of tangled up cable because it's too much of a hassle and wastes time to get it all straightened out. But when you don't have to worry about tangled cable, you can save a bunch of money by using every last bit of cable that's in the box. If you're looking to become an independent installation technician or an authorized retailer of DISH Satellite TV or HughesNet Satellite Internet, you've got a great opportunity teaming up with RS&I. We are a master distributor and sales agent with nine locations in the Western U.S. and we can help you get started on a new long term business opportunity. You'll get many benefits, like the fact we've established strong partnerships with companies like Digital Electronic Supply to give you the best equipment and tools you need to get the job done right. It's a great time to think inside the box!